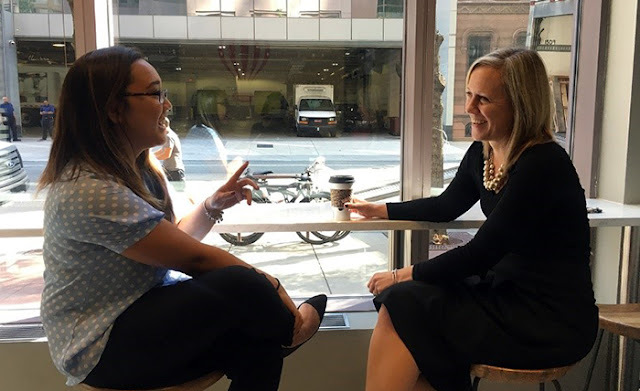 Launched in 2017, Janney’s Hybrid Mentoring Program was created with the purpose of facilitating the organic development of mentor/mentee relationships at the firm through guidance, mutual learning and networking opportunities. At Janney, mentees are empowered to drive the mentoring relationship by soliciting their own mentor and scheduling regular meetings with him or her to discuss the specific career goals they wish to achieve with the help of a mentor. The relationship between a mentor and a mentee should be a reciprocal one, and we strive to ensure that mentors and mentees gain mutual benefit from the experience. For mentees, the benefits include having the opportunity to discuss career goals confidentially, gaining insight into how to navigate the organization, and increasing self-awareness by uncovering personal blind-spots. Mentors will benefit from the relationship by practicing their leadership and interpersonal skills, gaining satisfaction from helping the individual succeed, and renewing professional energy by working with someone who is motivated to learn and grow. For mentee and Tax Associate Heather Machacon, the relationship with her mentor provided her valuable guidance and an outside perspective. “I knew that I wanted to go back to school, but now I know what I want to focus on. My mentor is very motivating and realistic. I feel supported. It helps that she is involved with so many things outside of work; it gives me an outside perspective,” said Heather who is being mentored by Karen Shakoske, Head of Marketing & Corporate Communications.